Infant Baptism, what does the Bible & Tradition say? Jesus said, Let the children come to me, and do not hinder them; for to such belongs the kingdom of God. Now they were bringing even infants to him that he might touch them; and when the disciples saw it, they rebuked them. But Jesus called them to him, saying, “Let the children come to me, and do not hinder them; for to such belongs the kingdom of God (Lk. 18:14-16). Martin Luther and infant Baptism: Martin Luther, while championing the concept of Bible alone, also used tradition when it served his purposes. The Church, he says, could not have been permitted by God to remain in error for so long a time. He pointed out that the agreement of the entire Church about infant Baptism is a special miracle. To deny it is to deny the Church itself. This teaching of Luther about infant Baptism is clearly stated in the Confession of Augsburg, 1530. There the Anabaptists were condemned because they repudiated infant Baptism and asserted that children are saved without Baptism. The error of the Anabaptist was also clearly rejected by the Council of Trent The New Catholic Encyclopedia. In other words, this handing on (tradition) of infant Baptism was an argument used by Luther to show the validity of infant Baptism when he spoke against the forerunners of today's Baptists. The Anabaptists did not believe in infant Baptism, and those who were previously baptized as infants were baptized again. The word Anabaptist means those who baptize again. Not only the Catholic Church but also the Protestant reformers: Luther, Calvin, and Zwingli, all considered the Anabaptists to be in error. Luther had moved away from the Catholic Church, and Calvin and Zwingli had moved progressively further still. However, the Anabaptists had gone too far; what they were doing was considered a great heresy. Protestant reformer Zwingli drowns Anabaptists: As a result, the Anabaptists were persecuted by both Catholic and Protestant governments. For example, Zwingli one of the Protestant reformers ordered the drowning of a group of men in Zurich who insisted on rebaptizing adults and who taught that only an adult Baptism, or a believer's Baptism was valid (History of the Catholic Church, p. 66, Alan Schreck). This was one of many actions taken against the Anabaptists. Baptist, Mennonite, and other churches that rebaptize often consider the Anabaptists to be part of their tradition. It is interesting to note that many people who have Anabaptist belief today are aware of Catholic persecution of the Anabaptists but are seemingly unaware of persecution by the major Protestant reformers. One such Baptist minister by the name of Bart Breuer ex-Catholic priest) speaks in glowing terms of Martin Luther, that great Holy man of God, and yet if he had lived at the time of Luther, he would have been on the run from Luther. Bart Breuer is an ex-Catholic priest who became a Seventh Day Adventist Minister; later he became a Baptist Minister. He manifests a particular distaste for the Catholic Church and invites Protestants and Catholics alike out of their respective churches, into the Baptist Church. Fox's Book of Martyrs opposes those who Baptize again: One very anti-Catholic book, Fox's Book of Martyrs, mentions the Anabaptists and Luther, Luther persisted in carrying out the work of the reformation, as well as by opposing the Papists, as by combating the Anabaptists and other fanatical sects; which, having taken the advantage of his contest with the Church of Rome, had sprung up and established themselves in several places (p. 164). Today, there seems to be a common myth that the Protestant Reformers were a united group of Christians fighting an evil empire called the Catholic Church. The truth is that the Reformation was not united; it was very divided on such things as Communion, Baptism and many other things. On specific issues, some of the Reformers were closer to traditional Catholic views than they were with one another. For example, Luther's understanding of Communion, Consubstantiation, was closer to the Catholic view than to Zwingli's understanding; Luther believed in a real presence, Zwingli did not. It is true that they fought with the Catholic Church, and it is also true that they fought with one another, sometimes verbally and at other times violently, as in the case of the Anabaptists. Are infants excluded from Baptism in the Bible? In Acts Chapter two, Peter addresses the crowd and we find the promise that the Holy Spirit is poured out on all flesh; "And in the last days it shall be, God declares, that I will pour out my Spirit upon all flesh" (Acts 2:17). Notice that this isn't limited to adults, but to all flesh. One Baptist professor claimed that they didn’t Baptize children in the Bible. According to this professor, Baptism of children didn’t happen prior to the year 150. However, the promise of Baptism is for you and your children and it is in the Bible. 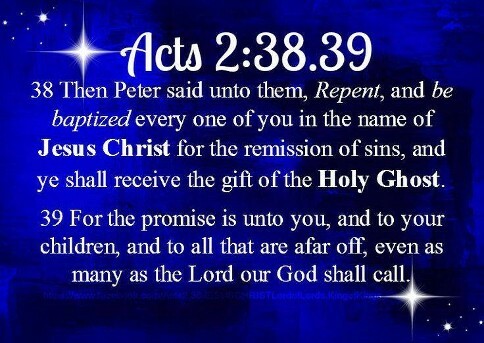 to you and to your children and to all that are far off, every one whom the Lord our God calls to him” (Acts 2:38-39). Notice that the promise of Baptism is not just for adults but for their children as well. Now the Baptist reasoning is this, since a baby cannot sin until it is of such an age that they can know right from wrong, they cannot be baptized. There are two problems with this. First since a baby does not have the intellectual capacity to sin, they cannot actually sin. The ability to sin; however, is not a requirement for Baptism. Sin is removed from an infant, but it is not actual sin but the original sin that we have inherited from Adam and Eve. There is another larger problem with the age restriction in Baptism. Baptists believe in a little concept called “Sola Scriptura” or the Bible alone. The claim is this, if it isn’t in the Bible they don’t believe it. The problem with this is that there is no age restriction that excludes infants from Baptism in the Bible. The age restriction that prohibits them from baptizing infants comes from their man-made tradition. If you wish to hear the sound of silence ask them (chapter and verse) where there is an age restriction for the Baptism of children in Scripture. If they give an answer at all, it doesn’t come from Scripture, but their Baptist tradition. Scripture is clear that there is no prohibition of Baptism for infants. The entire household of Steph’anas was baptized; "I did baptize also the household of Steph′anas" (1 Cor. 1:15:16). There was no restriction for infants or young children. Notice that Lydia and her household were Baptized and there was no age restriction or refusal to Baptize infants in her household. "After she and her household had been baptized" (Acts 16:15). The Jailer and all his family were baptized. Notice that all of his family was included and again there was no restriction of Baptism for infants or young children. "Then he and all his family were Baptized at once" (Acts 16:33). The rejection of child Baptism comes from the Baptist tradition, not from Scripture. And so, where did the Baptists come up with this age restriction, since it is not in the Bible? They borrowed it from the Anabaptist tradition of the 16th century. Zwingli admitted that the Baptism of infants is not forbidden in the New Testament: William Estep, who wrote the book, The Anabaptist Story, had this to say, Baptism is thus the most effective distinguishing mark of the Anabaptist movement (p. 175). When Zwingli debated the Anabaptists, Hubmaier, an Anabaptist, used Zwingli's words against him. "In relation to Zwingli's argument that the Baptism of infants is not forbidden in the New Testament, Hubmaier wrote; 'you protest loudly (and correctly) that Scripture testifies to no purgatory, but only to hell and heaven. Ah! Zwingli, could we not, even here, demand of you a prohibitory law, so we should not believe in purgatory? By virtue of your own teaching, you must show us a prohibitory word. Else you must reestablish purgatory, accept a new Papacy, and yield to the statements of the Vicar. Else is your present teaching erroneous" (p. 161). In other words, if Zwingli's supposition that infant Baptism is correct because there is nothing prohibiting it in the Scriptures, then to be consistent, he should (according to Hubmaier) believe in purgatory and the Papacy since there is nothing prohibiting these in Scripture. Of course, this type of argument works well against Zwingli; however, it doesn't work at all against the Catholic Church since the Church does believe in both Purgatory and the Papacy. And so, the truth still stands; there is nothing in Scripture prohibiting child Baptism. It seems that the strength of argument against child Baptism is in the simple saying so, and here are some of the ways that The Anabaptist Story says so: Therefore has the Antichrist, the abomination of desolation, the Pope, placed such emphasis on the accursed infant Baptism; To sum up, [infant Baptism] is a foolish and blind affair; (Grebel) Infant Baptism is a senseless, blasphemous abomination, contrary to all Scripture (p. 96, 151). These are just some of the many inflammatory statements made against infant Baptism. Grebel not only not fails to show that infant Baptism is contrary to all Scripture; he also fails to show that it is contrary to any Scripture. Of course, inflammatory statements were not the only weapons used. Hubmaier never tired of denouncing infant Baptism. He used all the weapons in his arsenal--the Bible, logic, sarcasm, ridicule, the teaching of Christ and the example of the apostles (p. 158). If Hubmaier really has sound Biblical arguments, then why does he need sarcasm and ridicule? At any rate, let's take a look at one of his Biblical arguments; I find no text which says go hence into all the world and Baptize infants, and teach those who are only a few years old (p. 158). Exclusion of infants not found in Scripture, in fact Jesus included them: Hubmaier is correct; there is no text like this in Scripture; however, there is a text that tells us to go out and make disciples of all nations, baptizing them in the name of the Father, and of the Son, and of the Holy Spirit (Mt. 28:19). Please note that this text does not exclude infants or small children. Although the Anabaptists claim to follow the Bible and the Bible alone, the exclusion of infants from Baptism is not found anywhere in the Bible. 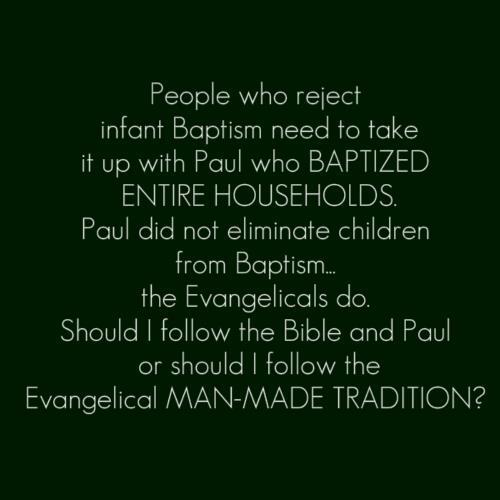 Exclusion of infants in Baptism comes from the man-made tradition of many Baptist and Evangelical groups. Many non-Catholic groups do embrace infant Baptism, for example Lutheran Churches baptize infants. Hubmaier admits this, but continues to hold to his position. It is clear enough for him who has eyes to see it, but it is not expressed in so many words, literally: 'do not baptize infants.' May one then baptize them? To that I answer: 'If so, I may baptize my dog or my donkey, or I may circumcise girls (p. 60). Jesus said, “Let the children come to me, and do not hinder them; for to such belongs the kingdom of God (Lk. 18:14-16). The Apostle Paul Baptizes entire households: Hubmaier's answer is not very well thought out. As to circumcising girls, this was not done; they circumcised boys, and not only that but circumcision was replaced by baptism. In him also you were circumcised with a circumcision made without hands, by putting off the body of flesh in the circumcision of Christ; 12 and you were buried with him in baptism, in which you were also raised with him through faith in the working of God, who raised him from the dead (Col. 2:11-12). As to baptizing dogs and donkeys, they would not have been included. When Paul baptized entire households (Acts 16:33) infants and small children as well as older children and adults would have been included. I realize this is an attempt by Hubmaier to strengthen his position by trying to make infant Baptism look ridiculous; however, I think this approach ultimately makes his own position look ridiculous. So far, Hubmaier tries to use logic, humor, and the Scriptures, to show that infant Baptism is unnecessary, useless, and an abomination before God (p. 60). Perhaps he will do better with the Fathers on his side. Early Church Fathers defend infant Baptism: Someone asked me on the phone if the early Fathers of the church practiced and recommended infant Baptism; some people were saying to her that they did; others were saying that they didn't. There is an excellent three volume work put out by William A. Jurgens called The Faith of the Early Fathers to help us answer this question. IRENAEUS [A.D. 180-199] Against Heresies: He came to save all through Himself, all, I say, who through Him are reborn in God, infants and children and youths and old men. Therefore He passed through every age, becoming an infant for infants, sanctifying infants; a child for children sanctifying those who are of that age,(vol 1, p. 87). HIPPOLYTUS of Rome [A.D. 215]: The Apostolic Tradition: Baptize first the children; and then if they can speak for themselves, let them do so. Otherwise, let their parents or relatives speak for them (vol 1, p. 169). ORIGEN [Post A.D. 244]: Homilies on Leviticus: The fact that in the church, baptism is given for the remission of sins; and according to the usage of the church, baptism is given to infants. And indeed, if there were nothing in infants which required a remission of sins and nothing in them pertinent to forgiveness, the grace of baptism would be superfluous (vol 1, p. 207).